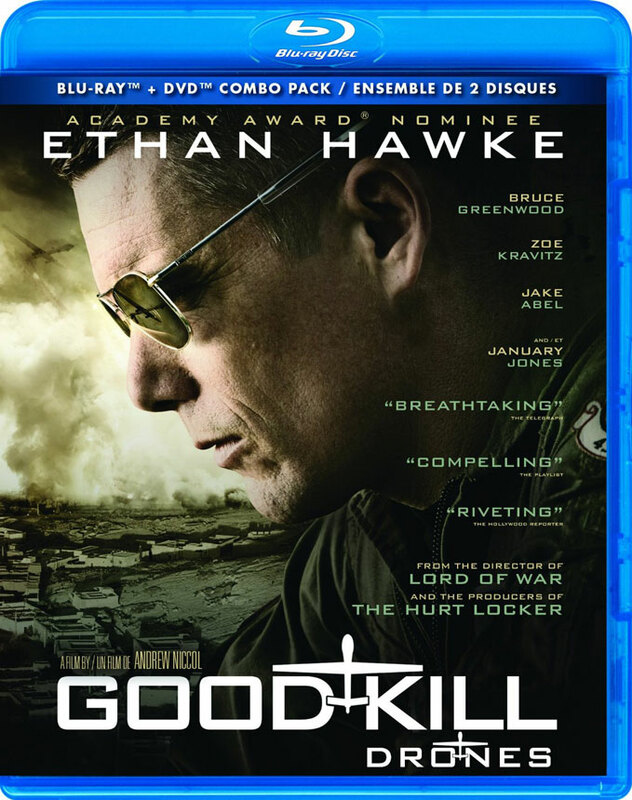 Ethan Hawke stars as Major Thomas Egan in Good Kill, about an Air Force pilot who is unhappy with his job. You see, he’s done tours of Afghanistan in the air as a pilot, but that was dangerous and not as effective as sending drones out to drop bombs on terrorists. So, from his post in Las Vegas, he enters a small, dark room, and when the order is given, he drops a bomb via remote control on a target in Afghanistan where terrorists are believed to be hiding. On the video screen, he also witnesses a woman in a black burqa who, while working outside, is almost daily beaten and raped by a man who comes on foot into her yard. The man doesn’t seem to be a member of the Taliban, so there’s never an order to kill him. Egan and his team cringe when she’s brutally sexually assaulted over and over. Egan hates his job and wants to return to flying, but the army refuses to give him the opportunity. Egan is married to Molly (January Jones), who can’t understand why her husband is unhappy. However, the first time we see him return home, the house is a mess and the kids are unruly. Molly doesn’t seem to care that her husband has an extremely difficult, emotionally draining job. Ethan Hawke plays Egan as a lifeless, morose creature who rarely speaks. He mopes around no matter where he is and is almost a non-entity in his circle of co-workers, family and friends (although, he doesn’t seem to have any friends – his wife does, but he’s not happy about that, either). He’s the protagonist of the film, but it’s very difficult to feel anything for him. The same goes for January Jones as Molly. A stay-at-home mother and wife, she rarely shows Thomas any sympathy and certainly doesn’t bother to make sure he has some peace when he arrives home. Although his wife should be his biggest supporter and a shoulder to lean on, instead she comes across as a woman who couldn’t give a damn about her husband. The usually fantastic Bruce Greenwood is given a role as Egan’s superior, but his inability to utter a sentence without the F-word is jarring and gives the impression that he’s trying to be cool for the younger people he’s in charge of – a less than desirable personality trait in a leader. I recently saw a much better movie about this topic – dropping drones on terrorists before they can commit more atrocities – that had me on the edge of my seat the entire time, so I know this could have been an interesting movie if it had been better cast and with a more exciting script. The Blu-ray doesn’t come with special features, so there’s nothing to show what it was like filming the movie – were there bloopers? Light-hearted moments on set? We’ll never know. Click here to watch the trailer. Other movies releasing on DVD this week include: Aloha, Big Game, Boychoir and Lila and Eve. Click here for a full list of new home releases. Saw it and I agree. It was boring and Ethan Hawke couldn’t have been more dull if he tried. He looked like he phoned his performance in. Seriously, he was blending into the wallpaper in the background. Why is this guy a leading actor? He has no charisma, he’s a plain looking guy – there are scores of better looking actors in Hollywood. I don’t get why he gets these roles.